Short on time? We've a huge range of ideas for quick team building activities that maximise every single second! Many of our corporate clients come to us looking for quick team building activities and even though they are quick, they can have a huge impact. The term ‘quick’ can mean different things to different clients and usually ranges from anywhere between 10 minutes and three hours, so naturally, there’s a huge range of different events ideas that can be hosted within these time frames. The great news is, we have lots of different and exciting quick team building activities ideas that we can offer your group! If you'd like to speak to an expert in quick team building activities then call us on 0800 083 1172 or fill in the quick contact form and let us know a good time to call you and we'll call you back. If you want to see our range of quick team building activities then take a look at our conference icebreakers, indoor events and outdoor events for an idea of how we can help your company! Let's take a look at three very popular quick team activity ideas. 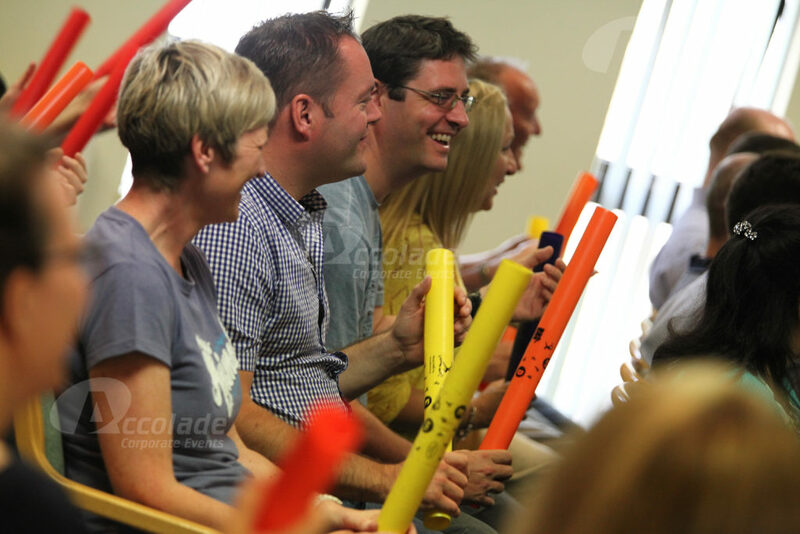 Boomwhackers are a great idea if you are really tight for time but want to invigorate your team and leave them in a heightened state of listening. Boomwhackers are a small hollow tube, they are different lengths and different colours and each one produces a different note that when you layer them on top of each other, can create an incredible harmonious sound. Our expert facilitator can build your group and deliver a meaningful quick session and can be hosted between 15 - 30 minutes and suitable for groups up to a whopping 10,000 and with no need for your group to even leave their seats, this is a perfect quick activity idea. The Big Picture - An incredibly popular quick team building activity! With this visual team building activity being suitable for up to 1000 people and hosted between 1 - 2 hours, this is a strong contender. 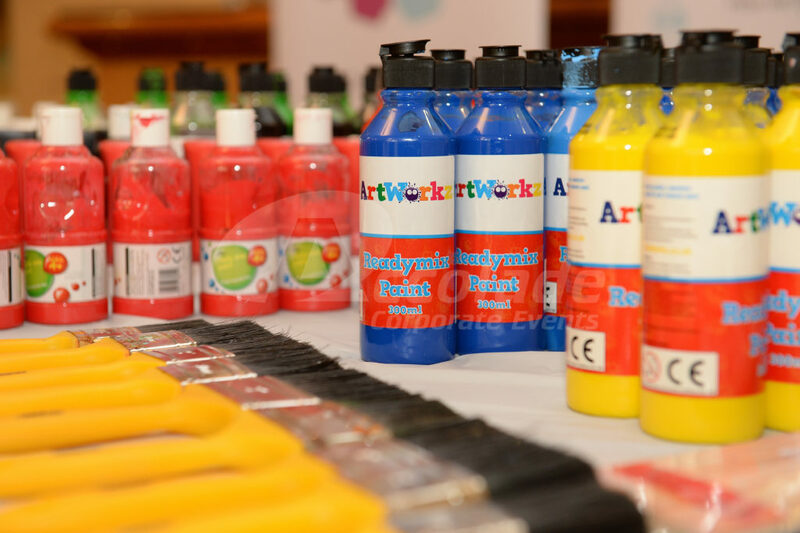 Working in teams on a section of canvass to contribute to the bigger picture, we can totally customise this creative event for your specific company message. We bring all the canvasses together to build the big picture as a wonderful conference finale! Gameshows are perfect for a little conference interaction and we've got many different ideas to suit all types of groups. Choose between Team Millionaire, Company Fortunes and Million Point Drop to name but a few. Our gameshows can last as little as 45 minutes and up to 90 minutes. We can tailor the shows to reinforce your conference message, making them a very useful learning and evaluating tool. Your delegates won't even have to leave their seats and we include everyone at the same time, everyone plays here, ensuring that all your delegates are engaged. Building communication is a popular objective for our clients. Sometimes your conference will be the only time you have everybody under one roof and you need to break the ice and build communication as quickly as possible, relaxing, inspiring and building the sense of your company as one big team. There are many ways we can easily achieve this, we've got some great ideas; Drumming will build your group like you didn’t think possible. Forget any preconceived ideas you may have about drumming, we only use experts at the top of their game, our facilitators are highly experienced in taking your objectives and conveying them in a motivational way and in a way that your entire team will buy into. Drumming events can be hosted in as little as 40 minutes up to three hours. Another popular team building event idea to build communication is Team Apprentice. Our version of this hugely popular TV show has been designed to specifically boost confidence and build communication amongst your teams – totally unlike the TV show! We can tailor it to your specific business objectives and like with the drumming, we only use the best. Our Lord Alan Sugar-Rush and his Eagle Eyed Advisors are trained actors and experienced event managers who know exactly how to get the best out of your team. We believe our events are only as good as the team we send out to host them, that’s why we always send out the best. If you’d like to find out more about quick team building activities for your next conference or event, then why not call us on 0800 083 1172 and we can listen to your objectives and advise you on the best ideas and solutions for you.